SAP EWM covers the Kitting and assembly of warehouse items extensively. 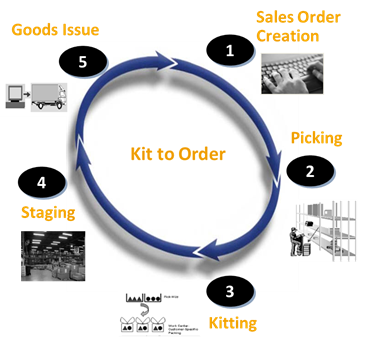 In warehouse management Kitting is the process of building kit products by assembling kit component materials including raw, semi-finished and finished products. Here the process flow begins with ERP/CRM sales order. Kits are built dynamically based on customer order requirements. Once the order is received the availability check gets triggered for the kit components. At times some of the kit components might be used in multiple kit assemblies. The availability check helps to identify the shortage of component stock immediately. Kit to Stock:In this Kitting process kits are pre-built to be stocked as an individual SKU. The availability check is triggered when the kit stock level falls below the defined MBQ. Kit to stock can be initiated through ERP production order or EWM kit order. 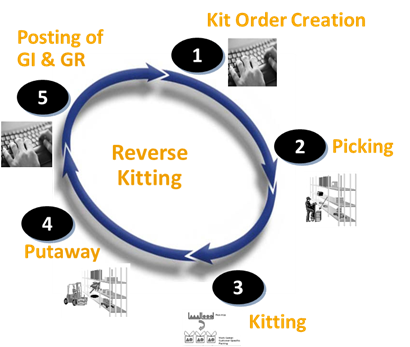 Reverse Kitting: When there is a demand to deliver kit components individually, the kits are disassembled into their components. The process of disassembling of a kit into its components is known as reverse kitting. It can only be initiated with EWM kit order. Once the disassembling is complete the kit components are put away in the warehouse stock. EWM supports kit-building both on an order-related and anonymous basis for the inventory as well as the dissolution of existing kits into its components. The kit can be integrated with other SAP systems (SAP ERP and SAP CRM) or EWM-internally. You can also check out the following webinar link for more on kitting.